Another beautiful find than this time I owe to my FB friend Mariusz Wójcik who sent me the video of "The Spirits of Starlight". The skeletons and strings of hopping sequences, very inspired by Steve Roach's ambient rhythms, as well as the enveloping synth layers full of cosmic choirs had literally conquered me. A new name which is added to this list of beautiful discoveries in 2015, Hollan Holmes is an American musician/synthesist native of Texas. The rock of Rush, REO Speedwagon and Journey, as well as the music of Pink Floyd, has guided his first steps towards a rock group at the dawn of his adulthood. He discovered afterward the magic of electronic music with Tangerine Dream, Jean Michel Jarre and Vangelis before to find really his style in the music of Robert Rich, Richard Burmer and Steve Roach. Names and influences which will be the cradle of “The Spirits of Starlight”. A very beautiful album, very lyrical, where the Texan transcends the clearly more esoteric style of his first 4 opuses with a thick cloud of motionless rhythms which sparkle and crackle such as flying sparks which always refuse to die, but prefer to born again in the fire of other embers. "Impulse" invites us to discover the charms of “The Spirits of Starlight” with a superb structure of ambient rhythm where our two hemispheres dance in countercurrent on a growing line of sequences whose tones sparkle as much as they dance. The rhythm is linear and oscillates with a velocity full of restraint under subtle pads of choir and of which the ghost harmonies sculpture a cosmic adornment. Another sequencer line emerges one minute later. More pulsing, it melts and fades in this rather ethereal decoration and pulls the strings for a lively rhythm. And as a sonic butterfly, the envelope of astral serenity who filled the opening of "Impulse" metamorphoses into a nervous rhythm with some lively jerks which flicker in the filamentous spirals of other sequences of which the blinkings as wriggling as subtle get lost into stroboscopic dusts. There is a constant battle of ambient rhythms throughout “The Spirits of Starlight” and the winner are our ears. If the movement of sequences is sometimes lively and jerky, the synth layers which float in paradox introduce other structures with their slow impulses which redirect the traffic of the rhythms in more esoteric zones. And it's clearly more visible in "Constant Velocity" which distances itself from the batch by its approach clearly more funk/tribal. Like Steve Roach and his aboriginal beats but livelier here. The percussions add a new dimension to the music of Hollan Holmes. They bind themselves here, with an attractive organic fragrance, within a rippling line of sequences which makes its keys flickering in the desert winds of the synth lines of which the slow movements are weaving an encircling contrast between a passive and ambient rhythm. 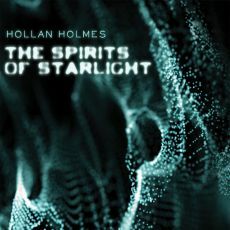 Winds which sometimes give the impression of roaring out, illuminating even more Steve Roach's influences on the music of Hollan Holmes. We always stay in the field of ambient rhythms even if "An Uninvited Guest" is sculpted in the atmospheres of the Dream, period Green Desert. Here as everywhere in “The Spirits of Starlight”, the movement of sequences is fluid and raises several contrasts with other evanescent lines which make the harmonious rhythms flicker and battle in beautiful synth layers filled of astral choirs. It's magic, as it's very soothing. "Enduro" swims in a pound of sequences as much as in the paradoxes of "Impulse". The sequences are lively and tear the atmospheres with fast snip of scissors in a kind of paper of sound, while another line of sequences rises and falls peacefully in order to forge a rhythmic ear worm pleasant to the ear. One of the other charms of “The Spirits of Starlight” is this constant metamorphosis of its structures and this no matter the envelope of time. "Pale Blue Dot" is the stormiest track here. A line of very irradiant sequences shine as a thick cloud of fireflies in a jar too small and of which the oxygen becomes scarce. Another line of sequences makes its keys waddle lazily, forge two lines of contrasting rhythm which little by little evaporates to make room for more celestial harmonies. We arrive then in the more ambient and really serene phases of “The Spirits of Starlight”, except for the title-track. "Scattered Across the Heavens", "The Departure" and "The Eternal Cosmos" are small jewels of meditative music very inspired by Brian Eno, Harald Budd and especially Michael Stearns for the very cosmic approaches. Those are beautiful and intense moments which are more in the repertoire of Hollan Holmes' first albums. The title-track is simply delicious. It mixes marvelously these very ethereal spaces of the three ambient tracks with lively sequences which rise and fall in the corridors of astral roller coasters. This is like pure Steve Roach, from Now to Empetus. Yes, quite a nice find that this Hollan Holmes! Thank you Mariusz. “The Spirits of Starlight” worths definitively the whims of your ears. Resonances, white noises, oscillations, lines of synth which float like clouds of ether and explosions. Explosions which reverberate into a structure of rhythm. "Intro" skids and zigzags with fury in a lively and heavy rhythm where lines of synth to the fragrances of Ricochet are caressing it, as if the time had frozen in 1973. There are things which don't change. Like the music of Mario Schonwalder and of his friends! In solo, in duet or in trio, Mario Schonwalder makes every effort to draw from the deepest of his influences to extract always the best of what retro Berlin School style would have lost through its numerous changes of phases. And he does it with as much skill as his passion for the genre. A logical suite to the very good Filter-Kaffee 101, “Filter-Kaffee 102” hits the market more than 4 years after the first adventure of the tandem Mario Schonwalder & Frank Rothe. This time, it's pure Berlin School. Not a zest of a shadow of zombie techno. Only exhilarating vintage Berlin School and a damn good one. Good old and a powerful one where the perfumes of Edgar Froese's solo works, the album he is dedicated to Edgar by the way, embrace the vertiginous rhythms of Ricochet and those heavier, darker of Redshift. Striking and simply what is done best in the genre! After the fall of first dark and resonant chords which seem so much mislaid and which sound so much like Redshift, the introduction of "RubyRed" dives into an ambiospheric state. Here, the tenebrous decor of the vintage years, either fluty airs and floating mists, roam over a fields of heterogeneous noises with tones as white as blacks which draw a Mephistophelian atmosphere. A radioactive cloud rises. A line of juicy and resonant sequences gets out of it. At the beginning the keys jump laconically before losing some shadows which skip more insistently and forge a fluid rhythm of which the deep oscillations won't escape to the caresses of a charming flute, nor the banks of Memotron mist. We are in the core of the vintage years. The Phaedra years with monosyllabic pads which fall like riffs on a superb pattern of oscillatory rhythm. Little by little the keys are losing the battle against the atmospheres and after a good 7 minutes of solid electronic rhythm "RubyRed" dives back into its second ambiosonic phase, very brief this time, before re-kicking the moods and forcing a less wild rhythm, a more musical one, where sequences dance freely among the fluty airs. Slowly this rhythm gets out of breath and "RubyRed" concludes its long trip of 21 minutes in the atmospheres of this fields of tones which had rocked its opening. 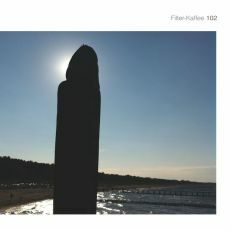 Between some very dark and menacing moods a la Redshift and of a Tangerine Dream of the Baumann years, the music of this “Filter-Kaffee 102” sharpens constantly the curiosity of the ears. As this introduction of "Sequence A" where nasal trumpets and dark choirs mislay sinister airs on metallic elytrons jingles which sound like snips of scissors in felted explosions and effects of gas. Three lines of sequences in parallels emerge. The dominant one forges a sneaky rhythm while the second hiccups with glass tones. Hardly perceptible, the third one makes shine its weak carillons which end to sculpture a hypnotic melody and of which the airs weakened will turn for a long time in our head. This polyphase structure moves forward stealthily with fine jerks which limp in banks of mist, filets of choir and synth lines perfumed by trumpets of Jericho. Charmingly Tangerine Dream and charmingly Ricochet ! And these fragrances of psychotronic moods go up to the doors of "Six-Eight Time". There where are escaping arpeggios which ring as when struck on an anvil in a universe of cloudiness. Still here the range of Tangerine Dream and especially Edgar Froese for the atmospheres of Epsilon in Malaysian Pale, in particular these hoops and these synth pads which derive in a universe where everything seems to have been eradicated from the earth, are strongly presents. The rhythm extricates itself from this sonic oblivion, where the flavors of ether abound, with a movement of sequences which multiplies its keys and of which the sharp capers bounce on the curves of another line of sequences. The movement becomes fluid and the rhythm oscillates of its ample loops and with its sequences to the contrasting tints which deeply flicker and among which the loops and the arcs are pecked by electronic percussions and their metallic bites. It's a good electronic rhythm of the vintage years, while "Darkshift" is even heavier, is in a more black pure Redshift. As if it was still possible. A wild and deafening rhythm escapes from layers of ether and from resonant bumblebees. The lifeless atmospheres are brief and let get away rustlings, a little as if we were near hell. Tom-toms resound a little after the two minutes point. The rhythm is black and felted, adorned that it is by layers of mists, lines of flutes and spectral rustles which always try to fasten "Darkshift" in the cradle of its atmospheres. Another line of sequence emerges then. A little as in "Sequence A" the rhythm spreads its phases, quite convergent, in a electronic shroud perfumed of analog fragrances. It's a heavy, a loud rhythm knotted in sequences with tones full of contrasts which pound cruelly around synth lines and their evanescent harmonies which stream and get entangled among dark kicks. Other lines, among which some very vampiric ones, besiege the rhythm. And no...The floating harmonies of the flutes, nor the caresses of the ethereal mists manage to control it. Quite the opposite! And other sequences run away, feeding the rich sequenced approach and a bit complex which nourishes the black strength of "Darkshift". This is a pure monument which gave me the taste to listen some Redshift. Splendid! And it's a pity that "Outro" sounds the knell of “Filter-Kaffee 102”. A wonderful album, available in vinyl by the way, where the duet Mario Schonwalder & Frank Rothe. surpassed itself downright with a superb album which is more than a tribute to Edgar Froese. It's a real profession of faith for the genre which, as long as it will be between hands as skillful and creative as those of Mario Schonwalder and now Frank Rothe, will stay always so bewitching, so enthralling and will live forever. Strange and fascinating that this last work of Mythos! More than 3 years after the solid Surround Sound Evolution, Stephan Kaske returns to us with a new rather audacious musical adventure which is freely inspired by the stories of Jules Verne. In fact, “Jules Verne Forever” pulls us literally where many film-makers knew how to bring us. Either towards charming sites in a work very ambiosonic and very cinematographic where we are surprised to see images of the books of Vernes trotted in our head with the same self-assurance as its books which have been brought to cinema. The approach of Mythos respects that of the film-makers such as Henry Levin, Cy Endfield, Richard Fleischer, Michael Anderson, and recently Brad Peyton, who knew how to put in image, here it's in sounds, the magical imagination of Jules Verne. “Jules Verne Forever” is 10 stories on 10 tracks. It's also 78 minutes of EM where the structures of rhythms, so difficult to put in a review as the images of Vernes in video, more oniric than lively take us now at the heart of the imagination of Mythos who raises this audacious bet with all the panache that we know of him. We notice the very stylized approach of Stephan Kaske from the first moments of "The Mysterious Island". A threatening structure of rhythm moves its keys which skip such as big sneaky step. A melodic line covers this start with a mixture of fluty jets and arpeggios struck on a kind of glass xylophone (Laser Harp? ), spreading straight away the big wealth as musical as sonic which will be the keystone of the 78 minutes of “Jules Verne Forever”. Don't look for the rhythms. They are present but not explosives. At halfway between ambient or lively, these rhythms which will move the ambiences of this last adventure from Mythos are as secret as the harmonies. Here we roll of the neck with this structure a bit ghostly. The glass arpeggios as well as the lines of flutes and their harmonies a bit jerky go and come as a merry-go-round which waves in a tunnel full of threats, while the basis of "The Mysterious Island" is pecked by percussions of which the strikes are so much in contrast with this marriage of flute and xylophone that our expectation towards a project of such a scale is approached with fineness. Mythos wraps all his structures of an incredible wealth So much that our ears, as well as our two hemispheres, run from left to right in order to assimilate these dark choruses, these vampiric solos, these mocking harmonies and these lines of harmonious sequences which sparkle, roll in loops and float on a structure of which the charms feed both of its ambivalence and of its imperceptible secret aim. And that will so be for the 9 other structures of “Jules Verne Forever”. "Mighty Orinoco" offers a heavy electronic structure which is hammered by an impressive meshing of percussions, pulsations and sequences. The shadows of the melodies which roam depict aptly the tensions of this unusual journey on this long Venezuelan river there. "Eight Hundred Leagues on the Amazon" takes a little the same bases, but with a rather Babylonian filmic approach. The deafening rhythm switches off its violence to make listen the charms whistled by a beautiful synth which sings, either in a jungle or with a Gregorian. It's quite intense that sounds very Vangelis, just like the very beautiful "Southern Star Mystery" and its tribal essence a bit phantasmagorical. The flute, the voices and the percussions blown in a kind of long blowpipe are releasing some rather poignant perfumes. By far the most beautiful track of this adventure with the solid "A Drama in the Air" and its slow rhythm which forges a fascinating ascent in an electronic setting to the thousand sonic flavors. We speak about rhythms difficult to describe? What to say about "All Around the Moon" and of its resonant spherical approach where organic sequences and keyboard chords are dancing in circle with their contrasts. "Off on a Comet" offers quite another approach with a rhythm which skips such as goblins in a cave where sparkle thousand subtleties and hoot strange magical voices of which the union with a Gregorian choir adds a surreal dimension to a music which drinks of the imagination of Jules Verne. The kicks of sequences, delicate needs to say, and the circles that they sculpture are in the heart of these imperceptible rhythms which feed the peculiarities of this album which reveals its charms track after track. I think here of "The Ice Sphinx Adventure" which is builds a little in the same mold. The title-track is more fluid and throws at us a delicate structure of circular rhythm which invades the ears with sequences in parallel lines and of sober percussions which roll in jerks. 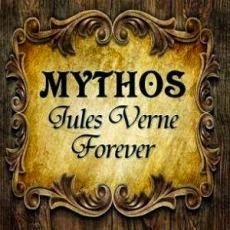 Here, as quite everywhere in “Jules Verne Forever”, Mythos forges a unique sequencing pattern with tones of prism which skip or brawl with others perfumed of resonances or of organic veils in the caresses of elvish voices or in the tendernesses of the fluty breezes. It's the rhythm which eventually put an earworm in the bottom of our ears. And this goes to for "Five Weeks in a Balloon" where the essences of "Off on a Comet" are more fluid, more lively and whose harmonies are also intoxicating as "Jules Verne Forever". If to describe the structures of “Jules Verne Forever” turns out to be an exercise which can miss words, terms, the music on the other hand lack of nothing. This last album of Mythos is at the size of this brilliant musician who tries constantly to push away his limits by improving this so unique tone that he knew how to develop over the years. The rhythms sparkle with freshness in an approach which becomes more harmonious than rhythmic. And the final effect is rather special because we constantly have the impression to hear a music which comes from another place, another dimension. Just like the imagination of Jules Verne. And in my opinion, it's the most beautiful compliment which we can make to “Jules Verne Forever”. Are you fans of horror movies and frightening tales? Enthusiastic followers of Stephen King? What would you say of hearing in music his book The Stand? It's visibly inspired by this book that Mark Shreeve has built the 7 tracks, the 40 minutes of his 8th solo album. “Legion” is distancing itself a few from the more progressive genre of Mark Shreeve's first solo albums with shorter and livelier compositions conceived at big knocks of sequencer and with superb atmospheric samplings apparently taken from the sonic libraries of the 80's horror movies. It's without a shadow of doubt the most rock album of the electronic community of this time when Tangerine Dream had charmed hundreds of musicians with its Underwater Sunlight and Legend Tour in 1986. It's also possibly the album which has introduced the movement of the England School. A movement which sent EM into some more rock bases and which has shown up its ears with the emergence of Ian Boddy, Andy Pickford and Wavestar. As for me; it's the most pop, the heaviest and the most lively album that I heard in the wonderful world of Electronic Music. With the years it became an inescapable album in my collection. An album which ages well and to which I still listen quite often, even nowadays. A heavy opus with jerky and wild rhythms set up by a brilliant play of sequencer and electronic percussions rolling to lose breath. Both rhythmic ingredients are supporting sweet, simple and effective melodies which at the end are simply frigging catchy. Using brilliantly and at the most the samplings, “Legion” is stuffed with satanic winks. It's thus with a strange incantation, with the looks of a Black mass, that begins the title-track. On this satanic incantation, a solid and heavy line of bass sequences opens the procession. From then on the rhythm becomes fast. It coughs in jerks on good percussions, metallic chords and a ultra heavy and powerful sequencer which sculpts a hard and heavy rhythm with the concert of a thick cloud of hard-hitting chords which tumble like furious percussions. The tone is set. Afterward this rhythm becomes kind of tribal's one. Those percussions mould a kind of speed-trance, which doubtless has inspired Juno Reactor, and push back the limits of the synth layers a bit philharmonic which even sound like riffs of guitar. It's at both times a heavy and fast piece of EM and also a totally demonic one that you would doubtless listened to from that era. Fragrances of it can be heard on the wildest parts of the Redshift repertoire. But some of you have already heard it, because it appeared on the Jewel of the Nile soundtrack, besides having played a lot on some dance floors, as prove its some Mixes and the 7'' released at that time. This cannon-shot is not isolated. There are several other very sequenced and very rhythmical tracks. Like "Sybex Factor" with its hammering percussions and its long synth solos combined to those of Chrissie Bonnacci's guitar. There is "Icon" with its unbridled rhythm, with its ultra nervous and rapid sequencer toyed by Chris Franke as well as these metallic wings and these shouts of bat. Finally, there is "Hammer and Cross" which arrived on the late. It's a bonus track which appeared on the first CD edition from Centaur Discs. Melodies are always anchored on those tracks. But there are other ones more catchy. Like on "Storm Column" which rolls on a structure of rhythm as much wild, as jerky of the title-track. It's a heavy and nervous with some light and melodious choirs which are in harmonies with a very sharpened synth. Moreover this mixture of voice samplings on a rhythm so jerky is completely brilliant. "Flagg" is another brilliant blow. The longest track of the CD opens with a very lugubrious intro, like in a horror movie B. A timid keyboard looses a melody with the charms of a threatening lullaby over a line of devilish sequences which accelerates the pace in the long sinuous lines of a magnetizing synth. The rhythm hammers a slow march, sometimes it sounds just like a walk of zombies on a high of vitamins. And still there, the samplings are superbly well used. With "Domain 7" we would imagine to be in a surrealist swamp with birds and wolves which cohabit on the jerks of violins and a keyboard of a harmonium style which glides over some splendid silky lines which adopt the long sensual curves of a dark and suggestive of Pat McManus' guitar. The effect is demonic and that's the spirit. Well...I guess! And it's even more pervasive with the strings of violins which resound on more symphonic layers. And the guitar is simply sublime. We feel its strings being deeply scratched so much the effect is realistic. Being more sentimental than rocker, it's my favorite track on “Legion”...but after "The Stand". We hear here a synth crying, suffering in an envelope of melancholy which can be feel at the tip of our sadness ropes which are hiding at the bottom of our souls. Behind a structure of a slower rhythm and effects of mist, a synth line changes its melancholic harmonies for those of a trumpet. This move makes raise the last bastion of our hairs which have resist to this desire to rise all throughout this adventure which is “Legion”. Not by its harshness, but by its sensibility and the hand put by the evil which seems to triumph. One would say some Ennio Morriconne who would have made a pact with the Devil in a finale more Mexican than Mephistophelian. But the tears of a baby returns us to the reality behind the precepts of “Legion”. 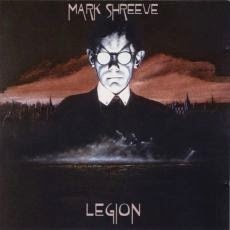 Even if closer to synth-pop, a rather progressive and a well worked one needs to be underline, than the other albums of Mark Shreeve, “Legion” remains an inescapable work. Just to see the price asking on EBay, we understand its importance in the chessboard of contemporary EM. It's the kind of setting that can please so much the lovers of a Gothic music, even if at times the melodies are hypersensitive, of synth pop and of heavy EM with a zest of radio FM's perfumes. Everything is structured well. So, no rooms for structures which deviate in random corridors of improvisation. It's a lively music filled of surprising samplings and built around a wild sequencing, the future trademark of Mark Shreeve, which preserves in spite of these two elements all its melodic dimension. Very good...Just hope that one day Mark Shreeve decides to reedit it. The magic of the social networks! It is by means of a video published by my good friend FB Rob Hartemink that I was interested in the universe of Skoulaman. A musician/synthesist who likes minimalist movements moved by echoes and reverberations, Skoulaman is part of this generation of new artists who are influenced by the analog EM from the 70's. From Tomita to Jean Michel Jarre, including Tangerine Dream, Vangelis and even Mike Oldfield, the music of Skoulaman crosses its identity phases until “Dreaming of the Future Reflecting the Past”. A 4th album where the Berlin School style binds itself to an EM with a more contemporary essence. The fusion is great. The result is surprising of a freshness which resources of its old fragrances with a very cosmic approach where emerge and revolve patterns of rhythm to fine permutations. Chronicle of a very beautiful album which is going to exhilarate you until its last second, both by its movements of sequences and its very lunar synth layers. Delicate arpeggios, molded in a little bit dark tints, skip delicately in the harmonies of a synth line perfumed of a fluty essence. From the first chords of "Dreaming of the Future Reflecting the Past", we feel that our ears penetrate a sound universe filled with the charms of the analog years. The approach is minimalist, delicate and even dreamlike. Sequences skip with hardly perceptible alternations in the pace, weaving a peaceful wave motion which sometimes will fit to the delicate curves suggested by the discreet impulses of a bass line. The synth divides its harmonious perfumes with tears a little bit piercing which get loose from the mist of flutes, exposing even solitary chords which sound as a pensive guitar in bank of manipulated by nice orchestral arrangements. What jumps to ears is this feeling of attention to details which livens up the musical writing of Skoulaman. Nothing is left at random and every phase grows richer of the previous one with nice variations in the tints and the tones. We thus notice hardly the progression of "Dreaming of the Future Reflecting the Past" which accelerates a little its pace at around the 5th minute point. The pace is more sure and enriched the perception of this ascent which is always perfumed by a synth of which the multiple fragrances are walking our souvenirs through the ages of EM. Let's says that it starts pretty good! The approach of Skoulaman is very Cartesian, on the verge of simplicity. His rhythms are knotted in the spirographies of the linear and/or rotary movements from the sequences among which the shadows, the echoes and subtle gaps between the editing command the obedience to bewitchment. More lively, more fluid "Without Boundaries" weakens its indefatigable circular loops in a more incisive pattern of rhythm, but always static, beneath the concerts of arpeggios which ring in the furrows of long twisted synth solos. After a very bohemian approach in "Sardegna Coasts", which is a relatively relaxing piece of EM, "Islands in the Ocean" throws us in Steve Roach's movements of Empetus. Superb, the track spreads lines of rhythms which attach their harmonious approaches as in a long roller coaster of which the moderate slopes and curves are undulating in cosmos. The electronic effects a little the genre of Jarre. We follow the crazy race of the sequenced movements with "Arabian Arp" and its deep kicks which oscillate in a dense magma of cosmic tones. The contrast between the slow orchestral envelopes and the deep movements of the sequences is as much delicious as those in the movements and the evolutions of the structures of sequences, like in "Orbital Moves". Sometimes quiet and sometimes agitated, the movement shows its nuances with silvery tones which sparkle in a universe in constant movement. Here as anywhere else, the synths snivel constantly, spreading slow morphic pads whose nasal fragrances remind me of Remy, by ricochet of Klaus Schulze, and counterbalance marvelously the variable flow of the structures of the sequences. "Voices of an Analog" perpetuates the sweetnesses of "Orbital Moves", but in a magnificent lento. Although slow, the flow is furtive with more bass pulsations which skip slowly in clouds of mist. A delicate melody is blooming through the tears of synths, conferring to "Voices of an Analog" the stamp of the most beautiful ambient track that I heard in 2015. "Sardegna Roads" has nothing to do with "Sardegna Coasts". Here, the rhythm is more than lively. It oscillates, it undulates with swiftness, multiplying loops on loops in a very ambiocosmic structure filled with pads of voices and where ring arpeggios which try to draw on an anvil an astral melody. The contrasts are as much fascinating as the subtle upward gradation of the track. "Far Away Worlds" ends this opus of Skoulaman with another pattern of rhythm sculpted in its contrasts and which spreads its attractive volutes in cosmic corridors decorated of starred sparklings. Object of seduction which wakes in us these delicate memories where EM have made compete, made sparkle its sequences into morphic and cosmic synth layers, “Dreaming of the Future Reflecting the Past” from Skoulaman is an album which will know how to seduce you. If some people hear sonic perfumes of Tangerine Dream there, it is rather true with the fluty synth, and even of Klaus Schulze, for the atmospheres of ether, me I hear influences of Roach, Jarre and even Ulrich Schnauss, for the small fragments of melodies scattered through these labyrinths of skeletal rhythms. But chiefly; I have spent more than a pleasant moment with the some 77 minutes of “Dreaming of the Future Reflecting the Past”.